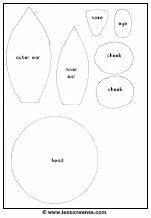 This page can be used as a coloring page, or have the children rip some bright colored paper to glue to the chicken’s body. 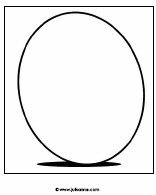 The purpose of this worksheet is to cut off the numbers from the egg-pictures. Then have the children glue the correct amount of eggs with the corresponding number. 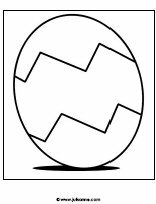 This worksheet is all about finding matching egg-pairs. Have the children cut out the pictures with the eggs. Next, have them make a sequence from large to small eggs. This game looks best if you laminate the worksheet so you can re-use it. There are 4 types of eggs in 6 color-combinations. 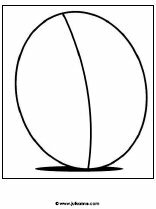 The children will have to find the correct egg in the diagram. This picture can be used as a coloring page. 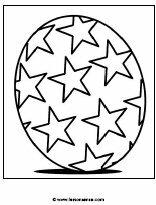 Alternatively, the children can use water based paint to color the egg. 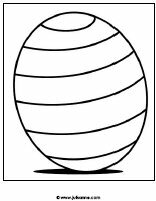 This picture can be used as a coloring page, or have the children decorate it in any other way. Another coloring page, or use gold colored paper to fill in the stars for a great effect.